Are you tired of always wondering what’s for dinner each night? Or what about when you go grocery shopping – aren’t you always naming off the same grocery items you buy every time you go? Then there’s recipe cards. Do you keep them stuffed inside a box? Now imagine you could make your dinner menu in your home VISIBLE. Imagine if you had a recipe card holder within sight while you’re cooking. 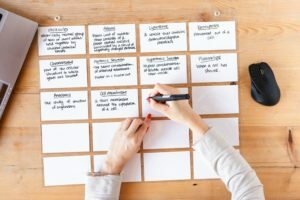 Imagine if you had your list of grocery shopping items saved on a “master list” in the kitchen where you could update the list with new items. 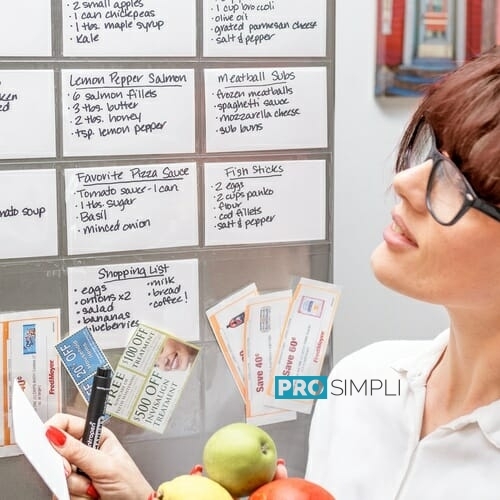 This is what our product, the ProSimpli index card holder, allows you to do. Heck, you can even put your coupons inside our sleeves. This is a new way of protecting, preserving and making your recipes, meal ideas, and shopping list VISIBLE and ACCESSIBLE. It has two holes for hanging with just two thumbtacks. Hang on your wall. You could also use double-sided tape to stick to a refrigerator. It’s really up to you where you’d want to hang it. The best place we think is inside a pantry where it’s somewhat out of the way, but it’s still more visible than not having it at all. The ProSimpli index card holder holds, as you might have guessed, index cards that are 3″ x 5″. This makes it very versatile. You can put ANY information you want on your cards. Our sleeves are also high-capacity. 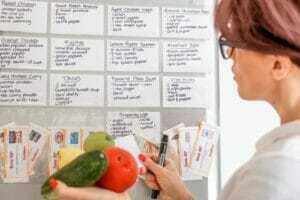 They hold up to 20 index cards, recipe cards, meal planner cards, grocery lists, you name it! If you want to purchase one for yourself, visit our product page here.